How important clean drinking water for you? Would your tap water be enough to sustain your health on a long term basis? With the rise of the health consciousness on a global basis recently, these questions become more important with each passing day. Many new technologies have also emerged to achieve the production of pure, clean drinking water out of our households, and among them is the topic of our discussion, the reverse osmosis system. "Among Reverse Osmosis System, Home Master TMAFC Artesian Osmosis Water because their top of the line reverse osmosis household product. The term ‘AFC’ stands for their patented Alkaline Full Contact technology. The full contact technology is unique with its added benefit of extra filtration and re-mineralization. We will discuss this technology further in the technical specifications section below." APEC Water ROES-75 Top Tier, Built in USA, Ultra Safe. "Among Reverse Osmosis system, APEC Water ROES-75﻿ Top is Sediment removal filter to remove dust, particles, and rusts ,Carbon block filter for double filtrations, eliminates chlorine, unwanted odors, colors, and cloudiness, as well as removing chemicals and VOCs.The High Rejection TFC membrane removes bacteria, arsenic, lead, fluoride, chromium, and other unwanted contaminants Coconut Shell Refining Carbon; the ‘polisher,’ removes residual tastes." The reverse osmosis system gained the public attention back on the start of the past decade. Since then, many households and commercial industries have adapted the technology to produce pure and clean drinking water in an affordable way. However, many people still misunderstood the technology, and are hesitant to purchase it. With so many types and brands are available on the market, making a purchase decision can sometimes be a daunting task, and those are the reasons we are compiling this guide. With the internet flooded with information, reviews, and guides, it is understandable for you to question the legitimacy of our guide. I am a real person of the medical profession and the real passion for health. With technology and science as my hobby, I try to combine both to help people achieve better health through technology. Before we can understand reverse osmosis, and its importance, we must first understand the term ‘osmosis’ itself. Osmosis is a natural phenomenon, and in fact, one of the most important processes happening in our environment. By definition, osmosis is a spontaneous movement of a liquid substance through a cellular, semi-permeable membrane. The movement occurs from a place with a higher concentration to a place with a lower concentration. Sounds confusing? Let us explain by an example. One of, if not the most important occurrence of osmosis in nature is how plant roots absorb water from the soil. When natural osmosis movements can only happen from a higher concentration to a lower concentration, the reverse osmosis allows the reverse direction. By applying some form of energy, we can reverse the osmosis process so that the lower concentrated substance can move towards the higher concentrated one. The reverse osmosis allows pure water to be separated from contaminants such as dissolved salts, pyrogens, bacteria, and organics, and other unwanted minerals. This process will be impossible with natural osmotic movements. Reverse osmosis system ‘push’ the pure water through the reverse osmosis membrane, while leaving the contaminants behind, and you’ll get a clean, pure water as the end product. Drinking more water is always a smart health decision! However, will drinking a pure, reverse osmosis water bring more benefits for you? There are a lot of microscopic contaminants that are unseen in your average drinking water. Yet, they can bring an extremely harmful effect to your body. A lot of us are afraid of the contaminants in our tap water, or simply don’t like the taste of it. Those two could be the major cause why you’re buying bottled water all the time. A reverse osmosis system can justify the long-term cost, and will be a better overall investment economic-wise. In the U.S. alone, Americans spent more than $14 billion on bottled water in 2015. When your tap water is impure, it will definitely affect the taste of the food you cook with. Reverse osmosis water simply tastes better, including when you make your coffee or tea with it. Many testimonies and studies pointed the major difference in both the taste and appearance of reverse osmosis water. The APEC Water’s ROES-PH75 was first introduced in February 2014. 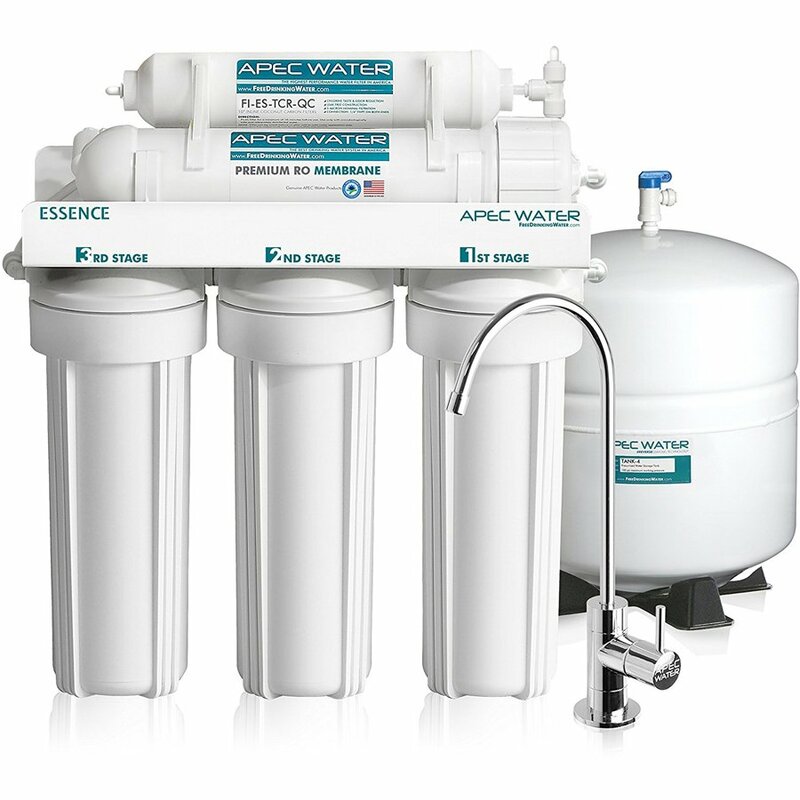 APEC water is one of the most renowned drinking water supplies manufacturers, with products ranging from water heaters/coolers to faucets to their advanced reverse osmosis system. -2nd stage: Carbon block filter; eliminates chlorine, unwanted odors, colors, and cloudiness, as well as removing chemicals and VOCs. As with any other products, of course, there are things we liked and disliked from this product. Let us start with the pros first. Can remove 1000+ types of dangerous contaminants. Easy and secure installation with high-quality quick-connect fittings. NSF and FDA certified food grade tubing. Only the carbon block filters and refining carbon need replacement every 6 months, other parts and filters can be replaced up to 3 years. A bit spacious in size (full size below). As with most reverse-osmosis systems, can also deplete useful minerals from the water. -You should be careful about your water pressure, as it will affect the reverse osmosis process. Refer to the technical specifications. -Make sure you have enough space in your kitchen cabinet, as this product is a little bulky. Refer to the technical specification above for exact size. APEC Water is a U.S.-based company with a well-known customer service and technical support excellence. This product is eligible for a 30-day return policy (depending on your retailer) and 1-year product warranty from APEC Water. Users reported that their warranty claim is reliable, and most users with technical problems or faulty products got their replacements or repair services within a considerable amount of time. iSpring Water Systems is a private limited company based in Georgia, United States. Established in 2005, they have been specializing in reverse osmosis water filtration systems for many applications and has gained a positive reputation for more than a decade. 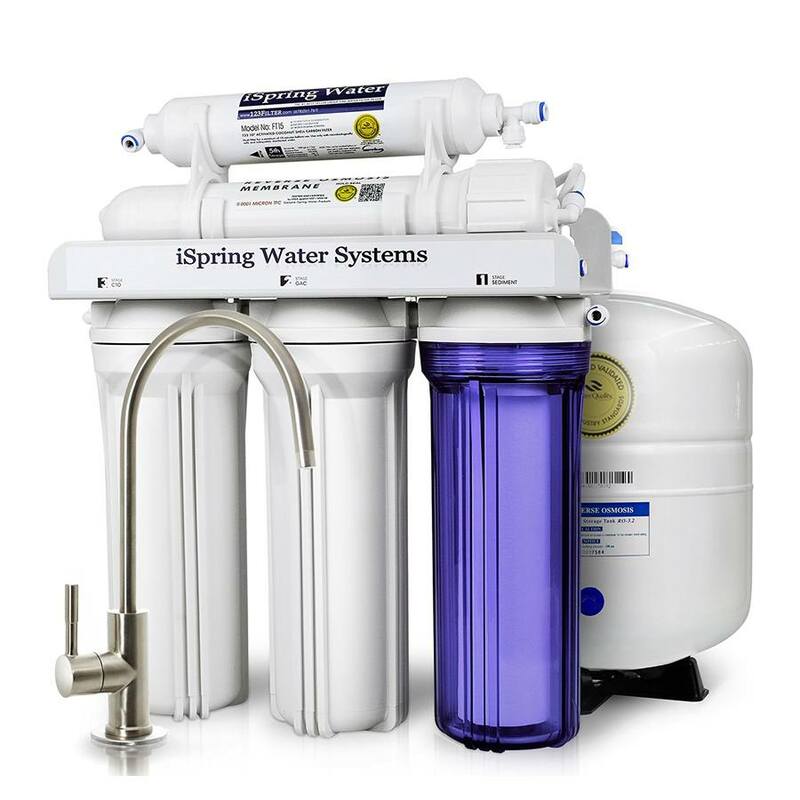 The iSpring RCC7, which we will discuss here, has been around since June 2010 and has been one of the most widely used reverse osmosis systems in the U.S. and around the world for drinking water purpose. The product has now been updated in 2014 to utilize more recent technologies. Here are some unique qualities and features that we liked and disliked from the product. A booster pump technology to regulate and optimize your water pressure. 5-stage filtering technology filters more than 1000 pollutants and contaminants. Transparent housings for visual monitoring. Water Quality Association (WQA) Gold Seal certified, an assurance for quality, safety, and durability. Lead-free brushed nickel faucet included. A bit spacious (see exact size below in technical specification section). iSpring Water Systems, is a Georgia, U.S. based company with a well-known customer service and technical support excellence. iSpring Water Systems also provides email support here. This product is eligible for a return policy with 15% restocking fee and 1-year product warranty from iSpring Water Systems. Perfect Water Technologies is a U.S. based company specializing in various water purification products. Has been around since 2002, the company has rebranded their household products under the brand Home Master. 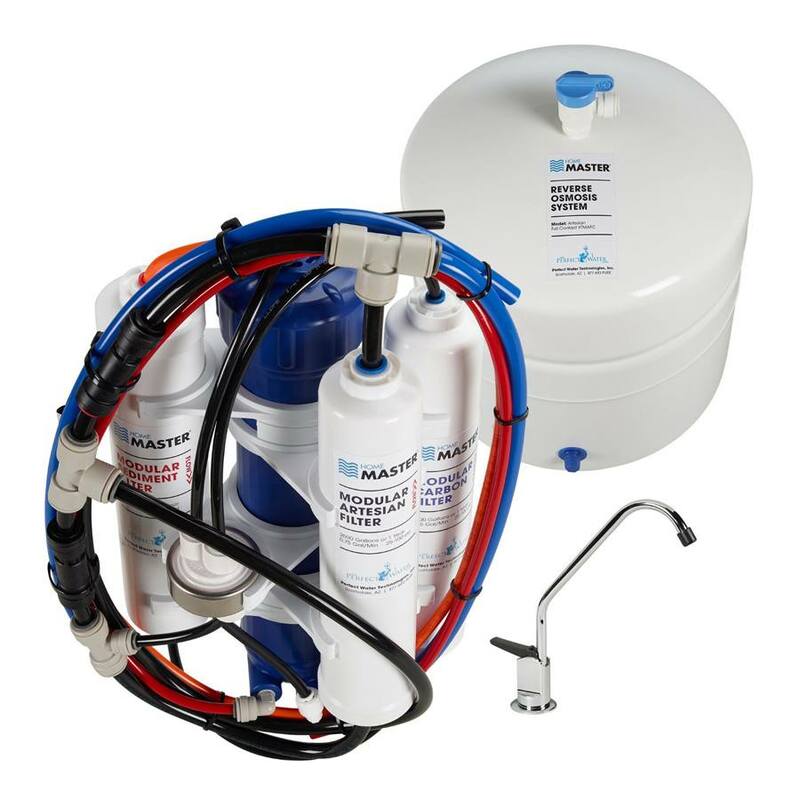 The Home Master TMAFC is their top of the line reverse osmosis household product. The term ‘AFC’ stands for their patented Alkaline Full Contact technology. The full contact technology is unique with its added benefit of extra filtration and re-mineralization. We will discuss this technology further in the technical specifications section below. -Full Contact Remineralization filter, adding back useful minerals like calcium and magnesium commonly eliminated in a reverse osmosis process. 7-Stage filtering technology with patented full-contact feature for re-mineralization. The added minerals enhance the taste of the water and its health benefits. The filters are long lasting, will only need replacement after 1 year. Water flows faster than other competitors, almost twice as fast. A little more expensive compared to its competitors. Filter replacements are also relatively expensive. -The installation procedure is relatively more complicated compared to other products. Perfect Water Technologies, the owner of the brand Home Master, is an Arizona, U.S. based company . Based on our research and experiences to the said group, their customer service, and technical support have always provided excellent services. limited warranty from Home Master. Check out the full details of the warranty here. Make sure to register your warranty here. There are generally three major categories of reverse osmosis systems: three, four, or five stage filters. Check your respective owner’s manual for the product to get a clear picture of how many filters you have, and the exact type and which filter belong to each stage. Carbon filters should generally be replaced once in a year. Sediment filters should also be changed every 12-months. Commonly the final stage of filters. The lifetime expectancy for polishing filters usually varies between brands, but commonly they should be changed every 6 to 9 months. The semi-permeable membrane is the core of the whole system. The membrane usually will need to be changed every 2 or 3 years, depending on brands and types of the product. With the filters commonly need to be changed every year, it would also be a good time to do a thorough cleaning and sanitization. After we have discussed the technology behind reverse osmosis systems, as well as some of the notable products we recommended. Being essentially a filter, all reverse osmosis system will produce waste water. Technically, a reverse osmosis system can achieve ‘zero waste’ by circulating the waste back into the system with some form of an electric pump. This technique, however, will wear down the filters more quickly, increasing your long-term cost. As a general rule of thumb, a good reverse osmosis system should have a maximum of 4:1 waste water ratio or less, meaning for every 4 gallons wasted, you will get 1 gallon of purified water. Generally, the more filter stages a reverse osmosis system has, the better the purified water quality will be. However, with every filter needing a regular replacement, the more filter you have in your system, the higher the long-term costs will be. 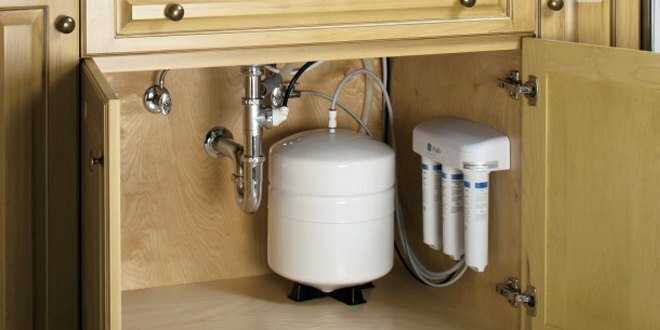 Installing a reverse osmosis system will disrupt your existing setup. Before making your purchase, make sure that the product will not require a major renovation or overhaul, and will be compatible with your existing setup. 1. Is Reverse Osmosis a Distiller? Ans. Although the principles between both are similar, with the same purpose of reducing dissolved solids from water, the process are different. Distillers use temperature to condense and capture the water, with impurities left behind in the boiling chamber.Reverse osmosis, on the other hand, relies on semipermeable filters. 2. Distilled water vs reverse osmosis water, which one is better? Ans. With the principle of using hot temperature to ‘filter’ the water, distillers won’t do a good job with chemicals and contaminants with a low boiling point.However, for the most part, both water produced are very pure. Ans. As we’ve also discussed above in our Ultimate Buying Guideline Section, reverse osmosis systems indeed will have waste water. However, based on many studies, the costs, in the long run, assuming you are using a good reverse osmosis product, is hardly noticeable. 5. How long will a typical reverse osmosis system last? Ans. If you maintain it regularly (see our maintenance section above), your system can last 3 to 5 years. 6. 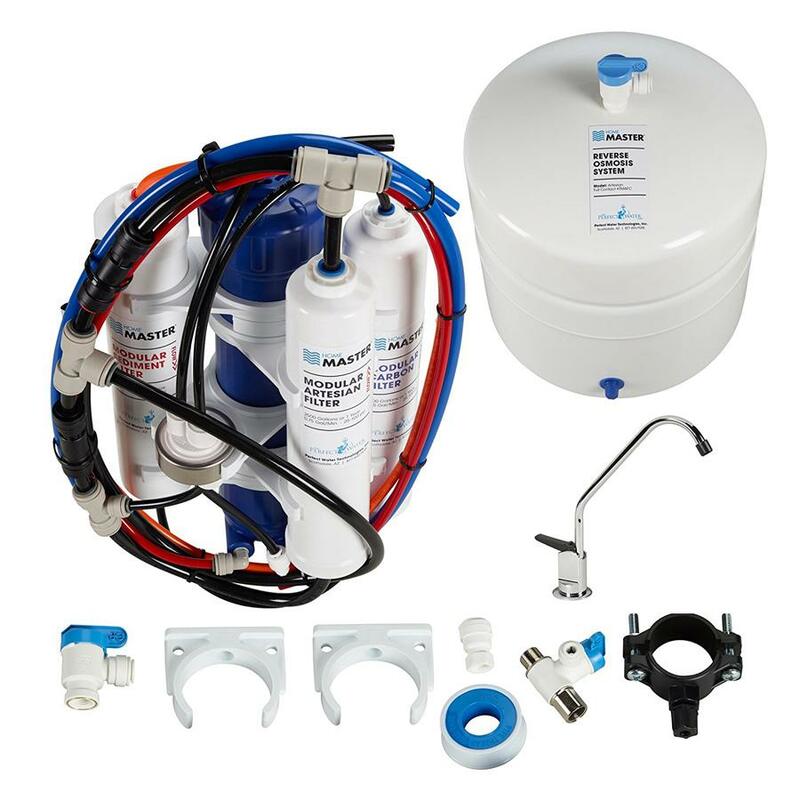 Is it true that reverse osmosis membrane won’t filter chlorine? Ans. It’s true because it’s not the job of the reverse osmosis membrane. Chlorine is filtered by carbon filters often found in the first stages of the filters. 7. Do reverse osmosis units need electricity? Ans. No, unless you add additional electric pump or ultraviolet lamp.Is it true that reverse osmosis systems remove minerals essential to our health? 8. It’s true, but it’s more of a matter of tastes rather than health issues. Ans. Based on numerous studies and medical journals, the minerals in water are inorganic and are rarely used by our body.However, a lot of people are used to the taste of mineralized water. Newer reverse osmosis system re-mineralizes the water for tastes purpose. 9. How is reverse osmosis water compared to bottled water? Ans. At the very least, reverse osmosis water as just as good as bottled water. More advanced reverse osmosis systems have also been proven to produce even purer water than bottled ones. 10. What contaminants are reduced or eliminated by reverse osmosis processes? Ans. There are more than 1,000 contaminants and pollutants proofed to be filtered by reverse osmosis systems. Among them are arsenic, barium, lead, fluoride, and selenium. All of them are potentially dangerous for humans. Out of the three products we’ve recommended, in the end, we will need to choose only one of them as our choice. Home Master’s TMAFC was unique with its 7-stage filters featuring their patented Full Contact technology. The Full Contact technology allows the re-mineralization of the water, adding the useful minerals such as calciums, which are often eliminated during the reverse osmosis process. Although the TMAFC was relatively more expensive compared to the other products on this list, we feel that the price is justified with its overall quality and unique features.